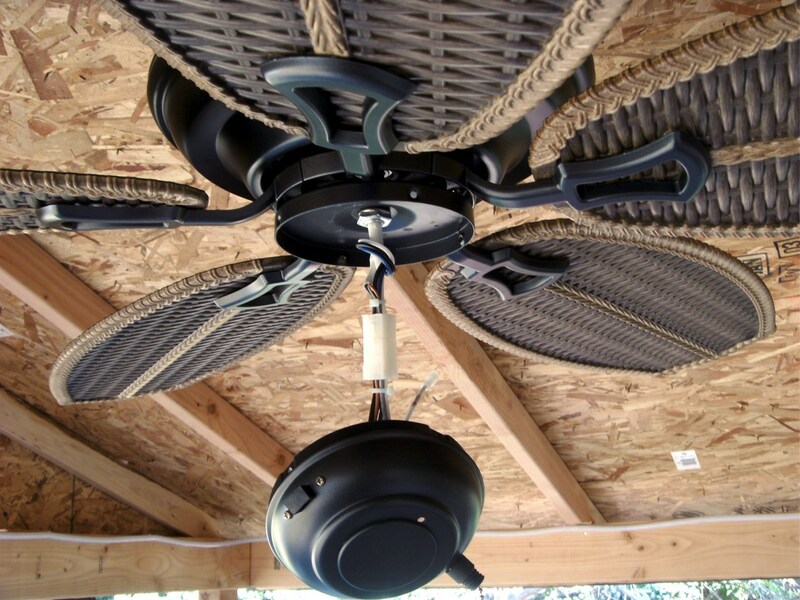 Ceiling fan installation is not difficult, it just takes a little time to get all the pieces put together. 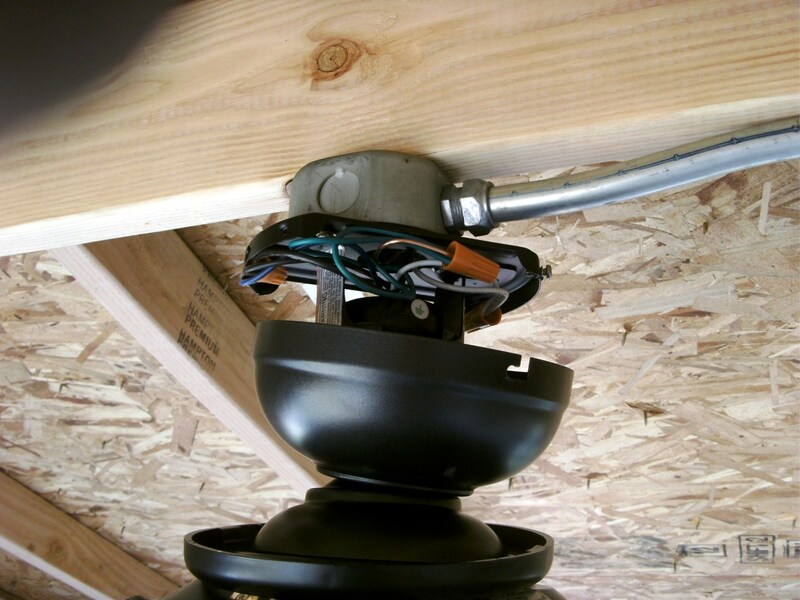 More difficult is finding or creating a place to hang the fan from; ordinary electrical boxes of the type commonly used in home construction are not designed to accommodate either the weight of most fans or the vibration they produce. 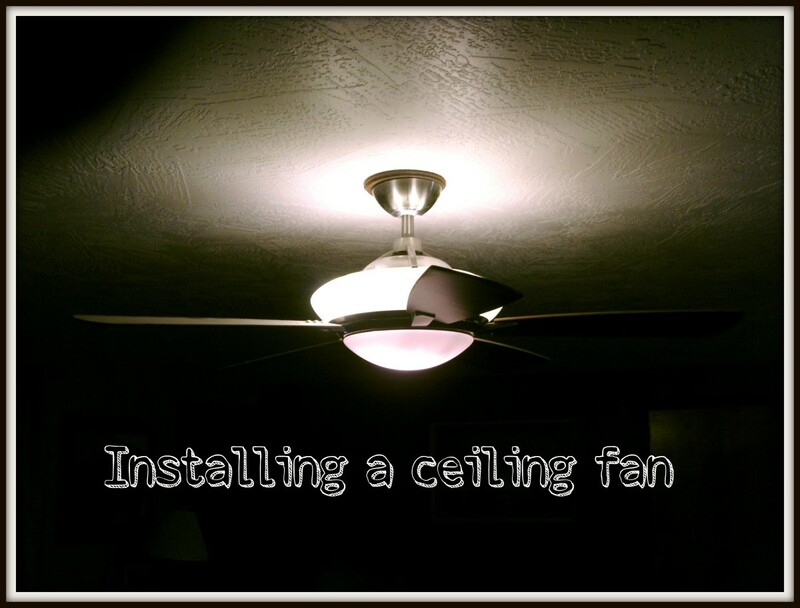 Anytime a ceiling fan is to replace an ordinary light fixture, then, it is necessary to verify that the box it is to be hung from is rated for ceiling fans, and this usually means replacing the current ceiling electrical box, so let's start there. 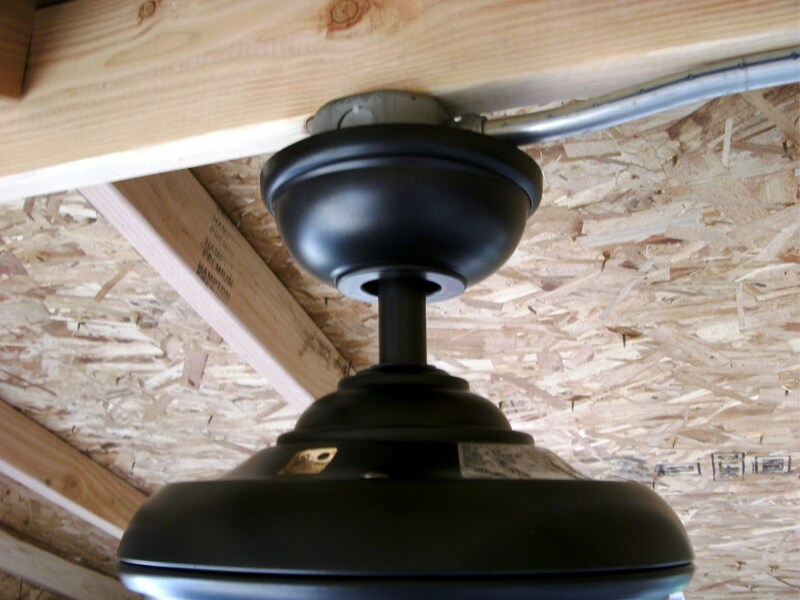 If access is possible above the ceiling where the box is located, it is a simple job to replace the current box with one rated for ceiling fans. 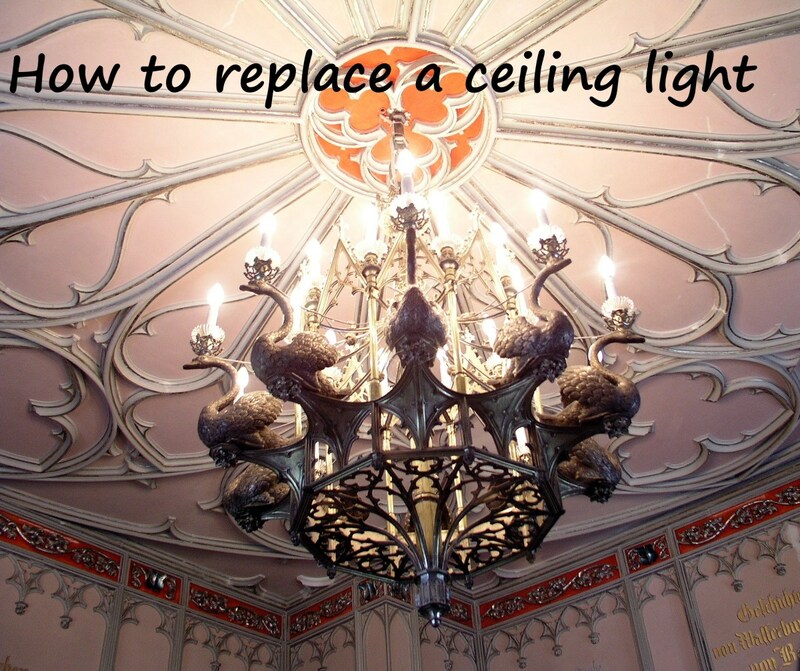 Remove any existing light fixture just as if you were going to replace it with a new light, and push any wires back into the attic. From the attic side, remove the box from the rafter or joist it is nailed to, and replace with a new box designed for a ceiling fan. Push the wires back into the new box and connect them as they were, leaving the same wires that went to the light fixture free for use with the fan. 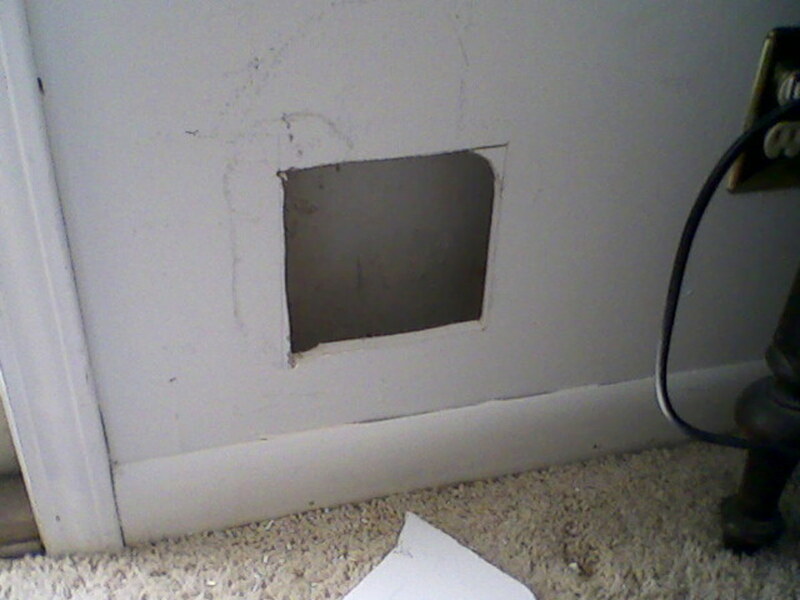 If access to the box is not possible through the attic, the box still needs replaced but it is a little more complex. 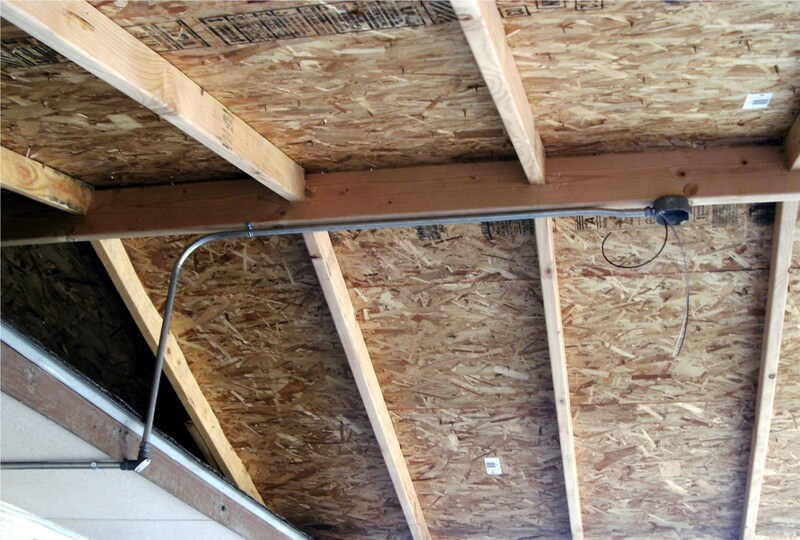 The old box must still be removed by either breaking it apart with a screwdriver and hammer or prying it away from the ceiling joist, leaving any wires above the ceiling. Special boxes are available for mounting through a hole in the ceiling; they have expandable bars that will reach out to the joist on either side of the hole and by turning a nut on the bar will be pressed against and into the adjacent joists. Alternatively, a joist can be located and a hole cut directly over the joist. A second type of specialty electrical box is available that will fit over the joist. In either case, the wire is pushed into the new box. If the hole for the original light box is left open it needs to be right beside the new box, and a ceiling fan medallion that will cover the hole purchased and installed above the fan. 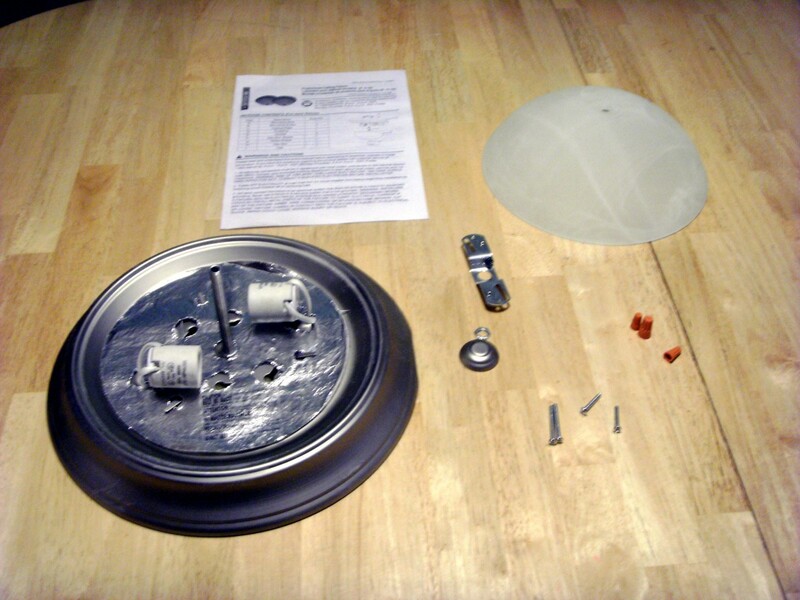 Although models vary, nearly all have some assembly required before the fan can be hung. Read and understand the instructions with your fan before proceeding. The fan in the example had to have the down rod and three separate trim pieces assembled first. The fan wires had to be routed through all of this to exit the down rod at the top. 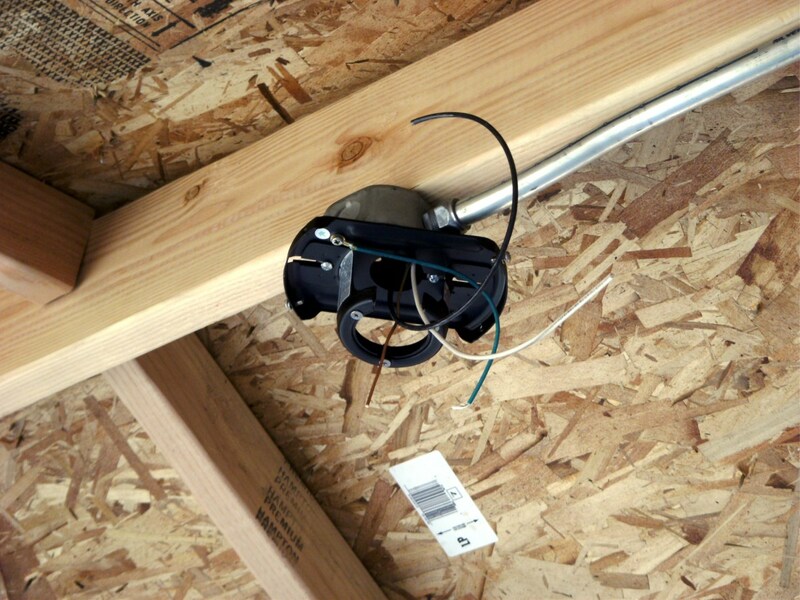 A special bracket was attached to the ceiling box and the wires again routed to where they would be accessible. Nearly all fans with down rods are simply set into the box bracket. 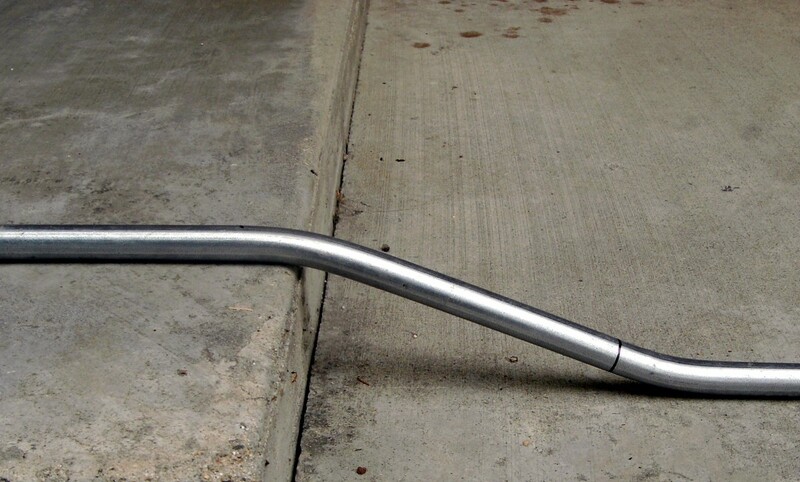 There is a large ball on the upper end of the down rod with a notch on one side; it sits into the bracket with the notch fitted over a small protrusion in the bracket. If the notch is not fitted properly it will allow the down rod to spin in the bracket, causing excessive vibration and likely damaging the wiring; be sure the slot is positioned properly. 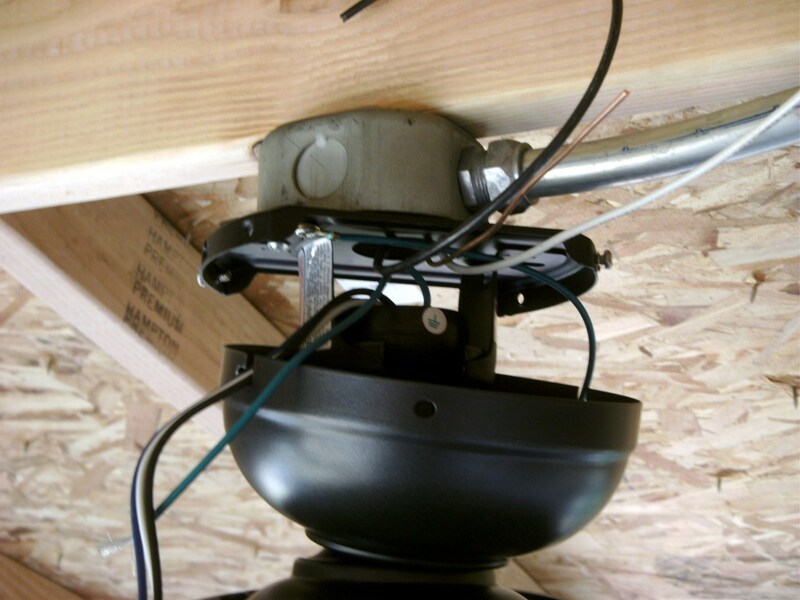 Flush mount fans normally have a hook that the fan motor can be temporarily hung from while making electrical connections, with final installation of the motor to the ceiling box done after those connections are made. Otherwise a helper will be necessary to hold the fan motor in place while the electrical work is done. Connect the wires from the fan to those in the electrical box; white wire to white wire and green wire to bare or green wire in the box. The fan will normally have both a black wire and a blue wire to be attached; the black wire goes to the black wire in the box while the blue wire goes to either the same black wire in the box or to another wire in the box that has been switched with a wall switch. If there is a switched wire in the electrical box it is usually, but not always, red. The only way to know for sure is to either test the colored box wires with a voltmeter or a non-contact voltage detector, testing both with the switch on and off. The unswitched box wire goes to the fan motor (black) while the fan light wire (blue) goes to either a switched or unswitched box wire. Splice with wire nuts, making sure that the nuts are tight and the wires firmly held and fold the wires into the box or available trim area that is to be covered with trim. 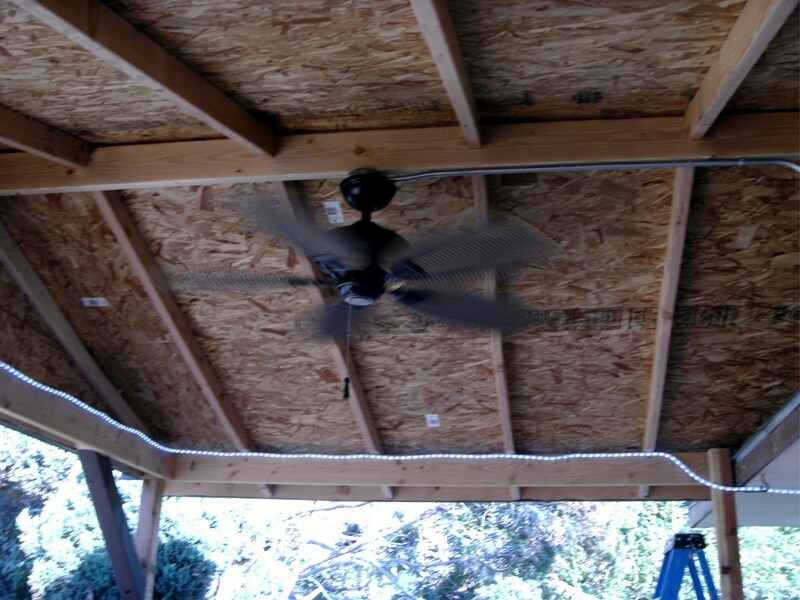 Any upper trim is normally installed at this time, and the fan is ready for the fan blades to be installed. There are few tools more valuable to an electrician plying his or her trade than a "tick tester" or non contact voltage detector. As a professional electrician there is always one in my own pocket when on the job. Easy to use and relatively inexpensive, they are an indispensable safety tool for anyone doing electrical work. Please consider the purchase of one of these non contact voltage detectors if you are to be doing any kind of electrical work. 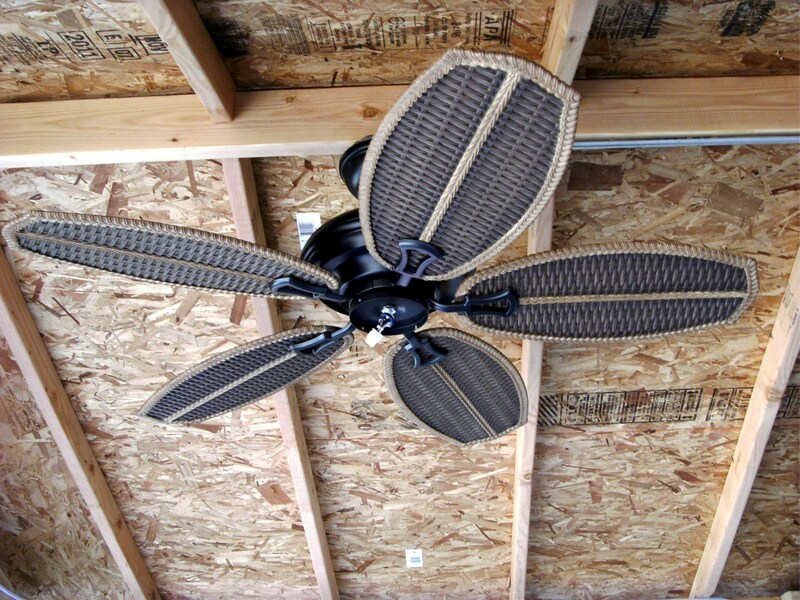 Fan blades are normally attached to a metal arm that in turn attaches to the fan motor. Three screws are the norm to attach the blade to the metal arm, but make sure the blade is right-side-up. Many fans have reversible blades, but you will certainly want them all with the same side down. In the example photos blades were not reversible, but top and bottom of the blades were considerably different and had to be mounted right side up. Most blades are made of wood, and have a very nice finish to them. 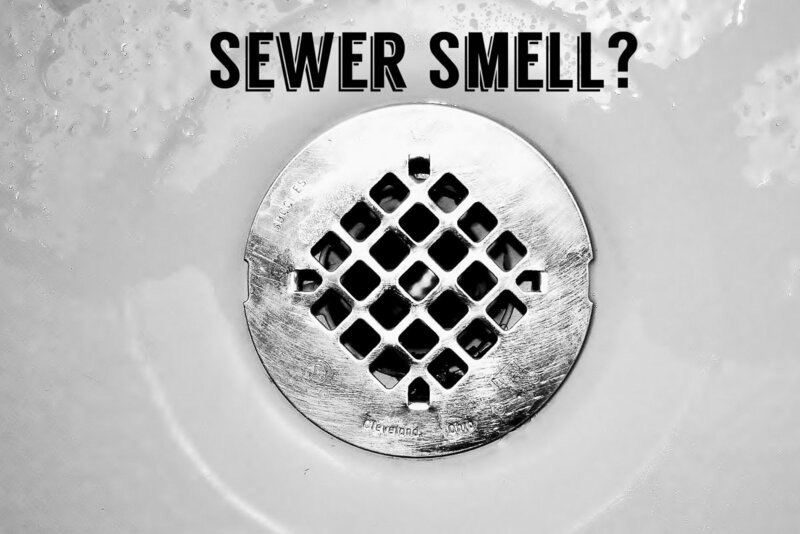 Take a little care with them so that they aren't scratched or marred during installation. Make sure all screws are firmly tightened; you don't want a blade flying off and across the room! 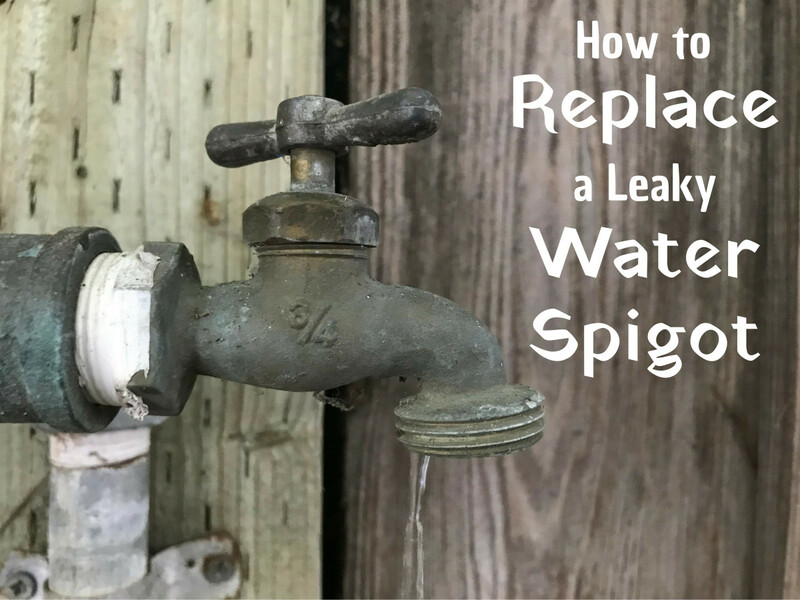 The metal arms usually mount with two screws to the fan motor, but finding the right holes in the motor to screw them to can be a little challenging. In the fan shown, a rubber plug had to be removed from trim under the motor to get a screwdriver to the screws. Other fans have holes drilled in a pattern in such a way that it is easy to get the screws into the wrong holes, whereupon the next blade, or just the last one, won't fit. Make sure you understand which holes to use and again tighten all the screws firmly. 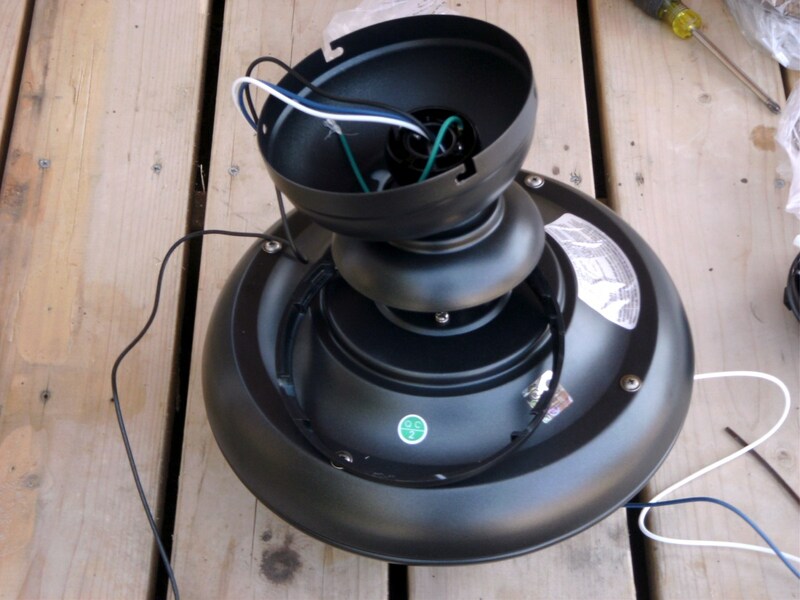 With the blades mounted, any light kit or bottom trim needs to be attached. The example fan had a wiring harness in the trim, along with the pull chain and reversing switch. The harness plugged into a matching harness in the fan motor and the trim attached with four screws; a rather common arrangement. Extra wires are usually found in this last trim for optional light kits, but are normally of the plug in variety and do not need to be capped off with wire nuts or otherwise made safe. Simply tuck the unused wires into the trim to hide them. 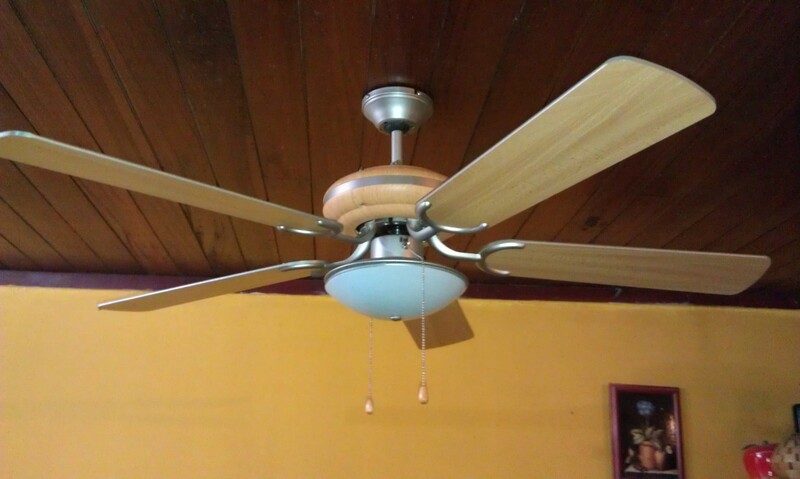 Test the work by turning the fan on and you're finished!